The WaveLight® Allegretto Wave® Eye-Q Lasers are designed to work with each patient’s individual prescription and cornea while aiming to improve what nature originally designed. The proprietary Wavefront Optimized® treatment considers the unique curvature of the eye, preserving quality of vision and addressing the spherical distortions that may induce glare and affect night vision. 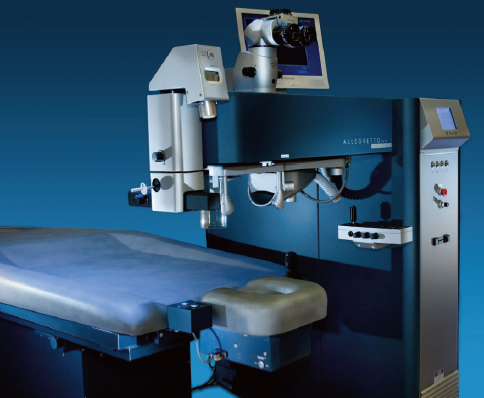 Therefore the laser systems perform an ablation with the objective to maintain a natural postoperative corneal shape and thus to preserve the cornea’s asphericity. By taking the K-readings into consideration, each treatment is adapted to the patient’s individual refraction and corneal curvature. Due to the angle of incidence, the light of the laser beam is ovalized increasingly toward the periphery and becomes partially reflected, which results in less fluence and thus sub-optimal ablation. Wavefront Optimized® LASIK places more pulses in the peripheral area to compensate for energy loss and reflections. This provides a nearly 100% optical zone and a minimized transition zone. At the same time, the natural aspheric shape of the cornea is preserved and the induction of spherical aberrations minimized.